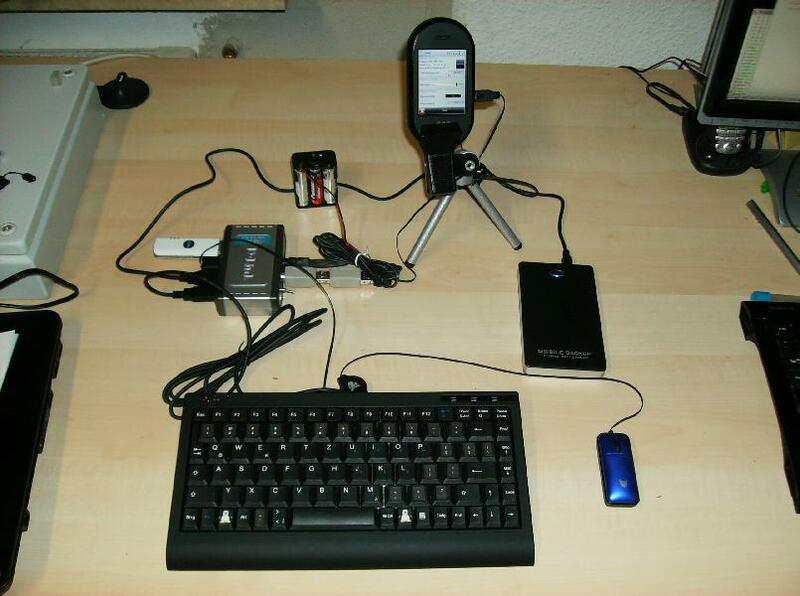 Mobile work-place ;) Freerunner beeing charged from a modified USB hub using 5 AA batteries. Full keyboard, mouse and external HDD connected! 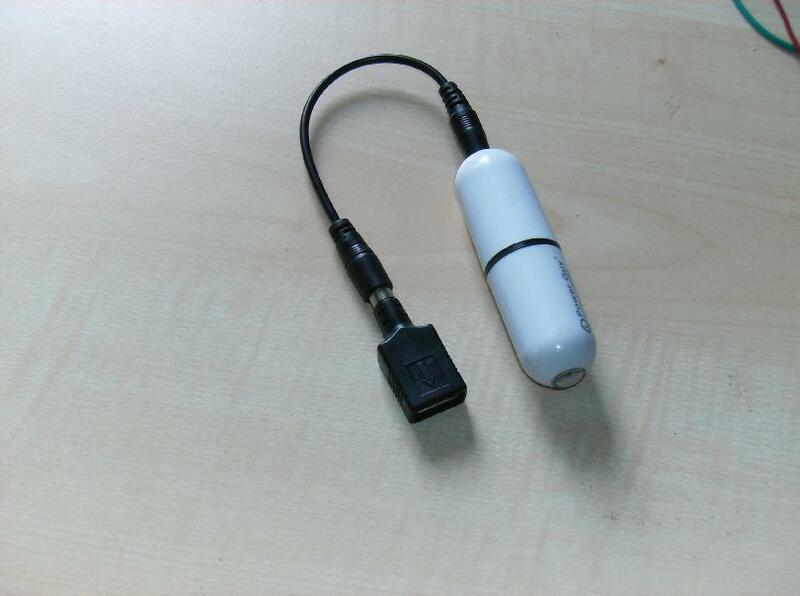 Internet access wia UMTS dongle. A special holder places the FR into a reflection-free angle. Note the TUX penguin, that I have manually glued on the 'Windows-Keys'! 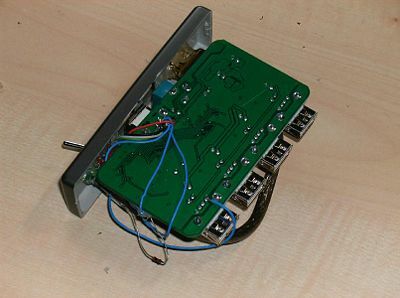 I have bridged the output power supply of the USB slots in the USB hub back to the 'input' line (where the FR plugs in). With a manual switch I can turn on/off this power feed. This might be some good luck that the good piece didn't blow off - it's a 20EUR DLINK hub. 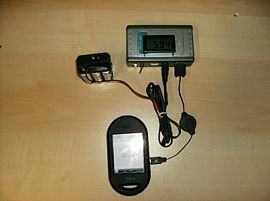 The power supply are 5 AA NiMH accus, which deliver around 6.5V when fully charged. This is about the same voltage the comes from the external AC/DC power plug. Note the single blue wire on the bottom right of the right image. This is all it needs. The rest is just fun like an additional switch with a LED to turn power-feed on and off and another Type-A USB slot, so that I don't need the genderchanger and the Type A/B converter any longer as one can see it in the topmost image. 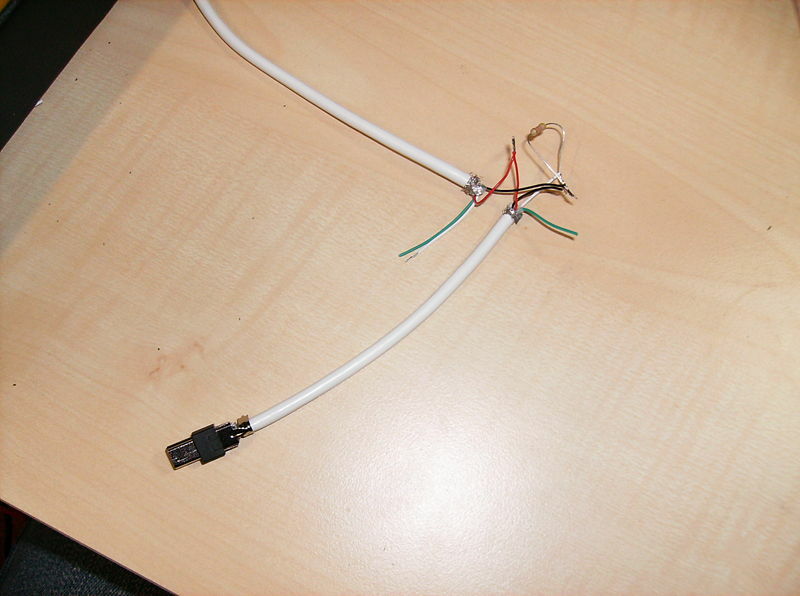 After I have soldered the second USB connector (the black thick cable on the left image), the hub did not work any more on a regular PC, although it still worked on the FR. 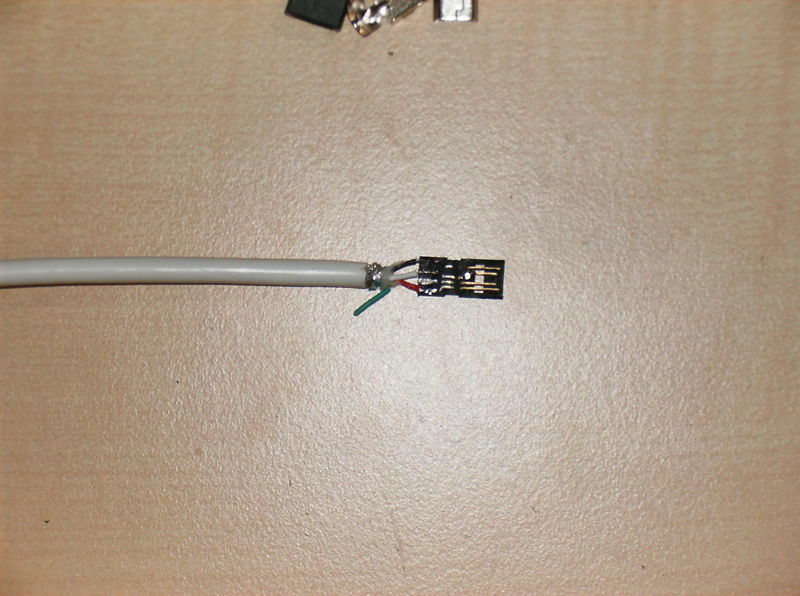 So my assumption is, that it is not broken, but maybe the USB signal reflects on the open-ended cable. I will invastigate further. Try this at your own risk! 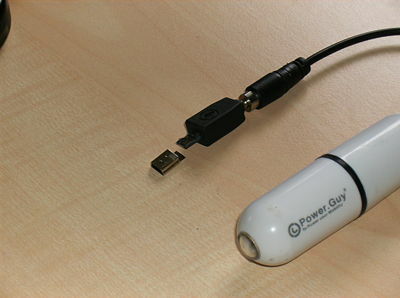 Be prepared to inflame your USB hub, power supply or even your phone! 'Short' way with self-soldered USB connector into the hub, which makes it unusable for PC's, though! 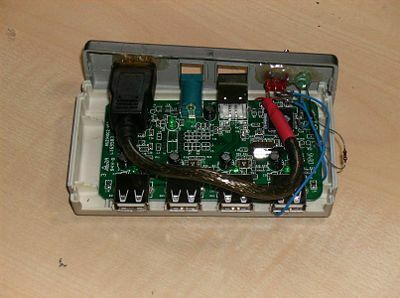 Integrated voltage meter in the USB hub, displaying either the HUB's own power supply voltage, or the voltage delivered from the FR to the hub, depending on the small switch that I have built in. LED indicating current direction. I cut the Data+ pin (3rd pin from top) and shortened the Id Pin (2nd form above) with the Data+ line, which is the white wire on the image. Note the small soldering poing, which bridges the cut Pin Data+ (wire only) with the 'Id' contact (to phone). Then I put the 47KOhm resistor between ground (black) and the 'stolen' Id pin (white). So far this works pretty good. But the mini USB connector is not the best. 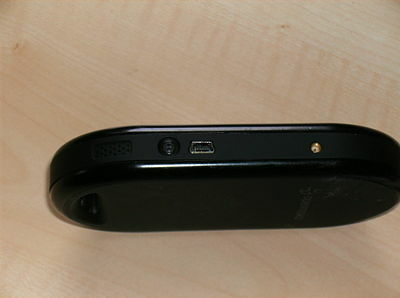 It has only flat contacts and fits very loosely in the FR USB slot, so very often there is a bad contact. I got this part from Conrad but would suggest buying something of better quality. 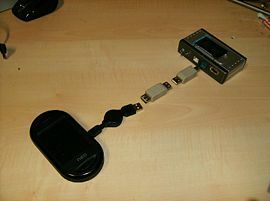 There are some mini usb extensions which provide a 5-pin wiring (can even be found at eBay). 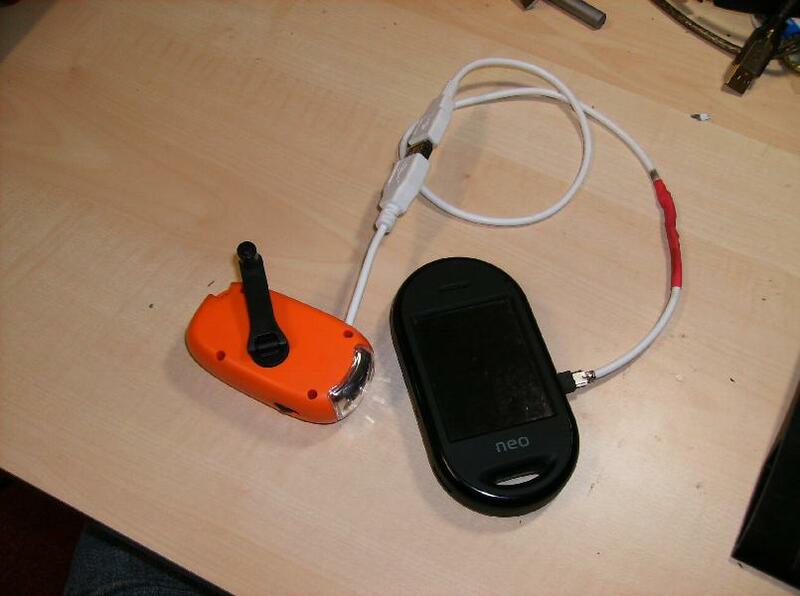 After various attempts to charge the phone with a bicycle dynamo (there are also some hints on the Wiki, I will add links later), I thought about charging the phone by manual power. So I stole the small lamp of my daughter which charges a 3.6V NiCd battery by turning a crank. So far this works pretty well, at least in theory - It is surprising how much strength one must spend to get about 300mA current. This is about what the good piece can deliver. Of course, the charging time stays the same: about 2 hours for a complete exhausted battery. So please imagine to turn the crank at full speed for 2 hours! This was a nice try, and maybe usable for emergency situations but not for daily live! 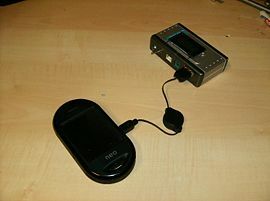 Second, it does not deliver enough power to recover from an empty battery. It brings around 100mA which can only help to lengthen the runtime of your phone. Some web sites support mobile browsers by reading the HTTP Flags sent by the browser. My experience is, that iPhone and Android are somehow supported by major sites (e.g. GMX, ebay etc). Also, some users reported that modifying the Identity flag might help sometimes. This solves many problems on pages that recognize iPhone as browser (still not perfect, but usable). Which works without browser identification. once and a reboot and we're done. See what 'top' says: the internal 128MB memory is almost always completely exhausted, with just one or two applications running. With 512MB swap space I can use Midori, tangoGPS, several terminals, the settings pages and so on all at the same time. I've written a small python script which takes a simple text file (e.g. output of mysql) and imports it into the phone's contacts database. It uses the dbus API of freesmartphone.org, which is used for example by SHR distributions. See http://wiki.openmoko.org/wiki/OpenmokoFramework/cli for details.